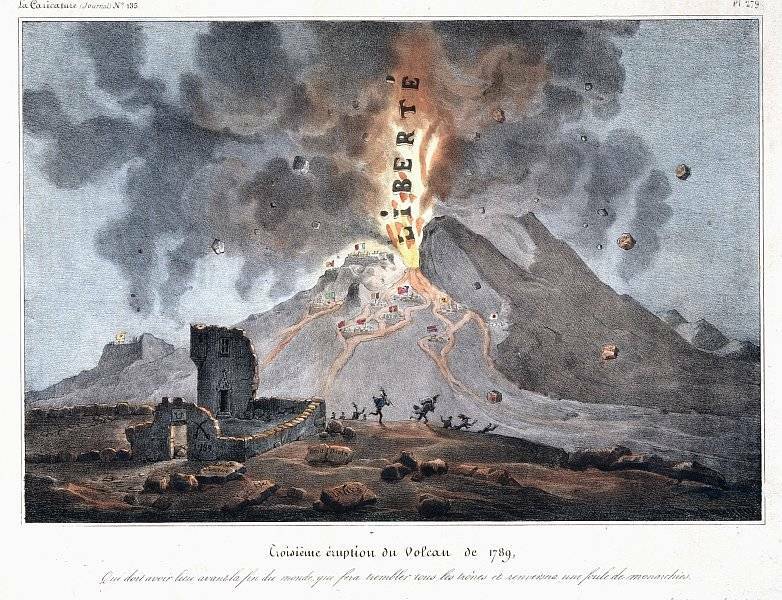 The subversions ongoing in the North African countries of Tunisia, Egypt and Libya have inspired a cartoon found by Malcolm and presented on his blog Pawn of the Pumice Castle - the depiction, aside from the ludicrous concept of geology, compares the rage of the people with a sort of magma chamber soon to feed a volcanic eruption (in Egypt already successful). The use of forces of nature as metaphor has a long tradition, especially phenomena as fire, floods or storms were often associated to negative historic events like war, invasion or plagues. In the 18th century the European revolutions to overthrow kings and dictators, especially the French revolution of 1789-1799, changed this negative significance, now fast occurring social changes were like disasters with a positive aftermath - the old becomes destroyed to make place for the new. It was still under the impression left by the great earthquake of Lisbon in 1755 that the metaphors of earthquake arouse - a local event hat could affect an entire continent. "Many parts of Europe are in obvious disorder. In many others there is a dull rumble coming from underground, a faint movement is felt that threatens the political world like a general earthquake." The picture of the volcano as positive symbol of insurrection against social injustice needed more time to become popular. Despite travel accounts and pamphlets, an erupting volcano was a rare event in Central Europe and mostly unknown to the larger public. In contrasts the popular tumult in Naples of 1647 was promptly compared to a volcanic eruption by the contemporary chronicles. "In the Royal Palace the most violent invocations followed with tremendous speed, the most violent orators jumped on the tables, inflamed the minds of their audience, which assembled around them, then to spread into the city like the burning lava of a volcano." Fig.1. "Third Eruption of the Revolutionary Volcano" (original caption "third eruption of the volcano of 1789, to take place before the end of the world, which will shake all thrones, and overturn a horde of monarchies") by Auguste Desperret (1804-65), lithography published in the magazine "La Caricature" of June 1833. 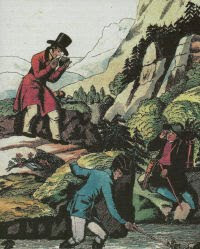 Only after 1795 depictions of eruptions became commonly associated with social revolution (see also the volcanism blog for a further analysis of the image).